This issue reviews the uses of positron emission tomography (PET) for imaging the musculoskeletal system. Because PET imaging has been particularly effective with regard to imaging of tumors, this issue includes several issues on detecting primary as well as metastatic bone tumors. 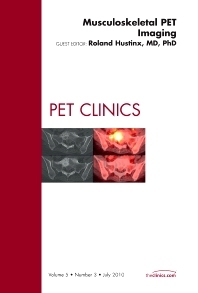 PET’s use in imaging soft tissue malignancies and musculoskeletal malignancies are also reviewed. This issue also explores the uses of PET for osteoporosis and inflammatory and infectious diseases. The development and applications for alternative radionuclide tracers is also included.